Yule Love It, 2 coats outdoors. 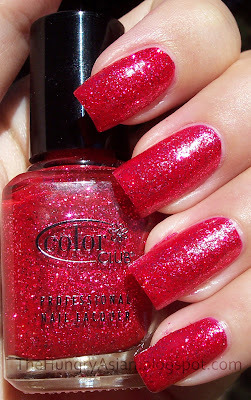 The base color is very pigmented as you can see, it is a raspberry red color with lots of glitter. I could sit around and admire this all day I think! Wonderland, 2 coats. This is clearly a 3 coater (or more) and would be fantastic for layering. The larger pieces of silver glitter are square, and amongst them are very tiny pieces of silver glitter. This compared to say, Orly Tiara is so light and delicate it really does feel like you are in Wonderland! damn... both are very pretty. Oh! I really want to layer Wonderland over white. Yule Love It has such a gorgeous base color with all that glitter thrown in. So pretty on you! I tagged you! I'm not sure if you like to participate in such things, but do play if you would like. Both are stunning but I love the red one the best! Holy Christmas! That top one looks like the perfect holiday polish. I like the... jellyness of it. Very cool. I definitely don't have any polish like that. I just got all the Color Club glitters from Japan and also the Halloween mini set. Now I have to get these! I love them both. I just love glitter. Your nails look amazing in both shades. Oooh, both are gorgeous! 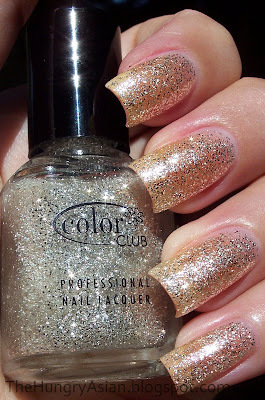 I think my fave is Yule Love It, but I bet Wonderland would look amazing layered! They do the best glitter. I want to layer it over everything, but ultimately the cleanup stops me everytime lol. this glitter wasn't as bad as say, the new china glaze I got recently. thanks for tagging me I just posted my thing!